Nagambie is a rural township on the Goulburn River in central northern Victoria, 27 km north of Seymour. It is on the Goulburn Valley Highway and the railway line (1880) between Seymour and Shepparton. Farm selection activity began in the mid-1860s in the Nagambie district, and in 1868 the Nagambie township was gazetted. It was located beside a flood prone horseshoe shaped piece of ground which was usually surrounded by a lagoon on the town site. Nagambie is thought to be an Aboriginal word meaning lagoon or still waters. 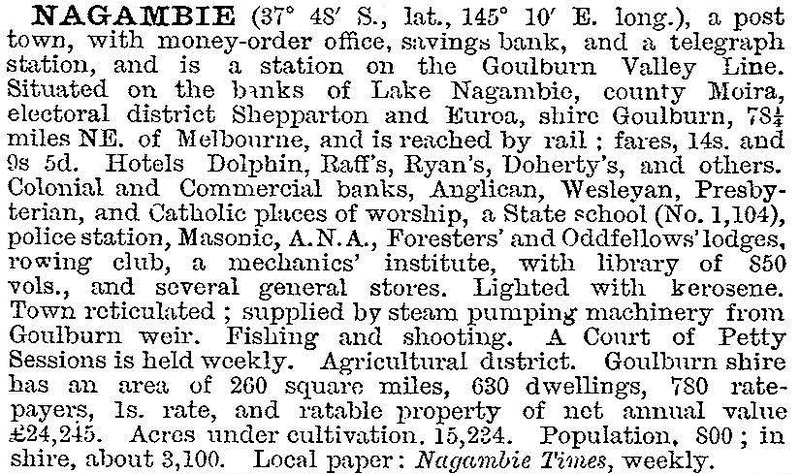 Within ten years Nagambie had a school (1870), a Catholic church (1872), a mechanics’ institute and two flour mills. There were 76 buildings in the township in 1877. The Goulburn Valley vineyard, one of several in the district, adjoined the lagoon. In 1871 the Goulburn shire was created, with Nagambie as its administrative centre. A local waterworks trust was formed in 1886 for a town supply. In 1885 a pumping plant was installed on the Goulburn River near Nagambie to supply water for stock purposes. Five years later it was superseded by a weir on the Goulburn River, causing water to bank up and turn the lagoon into Lake Nagambie. The weir began the Goulburn Valley irrigation area. Shortly after the filling of Lake Nagambie a rowing club was formed, holding the first of its annual regattas in 1898. The club was the Victorian Rowing Champion Eights in 1934. Nagambie grew as the largest township in the Goulburn shire and some settlements, particularly in the gold mining district, declined. Nagambie itself is not greatly assisted by irrigation works, but its hinterland is mostly undulating, used for sheep grazing, with intensively farmed land near the Goulburn River. About 7 km to the south near the river there are the Chateau Tabilk vineyard (1860) and the Mitchelton vineyard (1970). Tabilk is a small settlement now mainly known for the vineyard. Its school (1868) has closed. Nagambie is known for its lake, with several jetties for rowing and speed boats, and a swimming area. The caravan park near the lake was removed in 2008, and there are two others near the river. There are also a golf course, a recreation reserve, a swimming pool and tennis courts and bowling rinks at Glass Square recreation area. In 2010 the Australian Rowing Championship was held at the upgraded Lake Nagambie facilities. A convent school supplements the State primary school (108 pupils, 2014) and there are a bush nursing hospital (1929), four churches, three hotels and three motels. The former shire hall and court house is home to the Nagambie Historical Society and museum. The township is noted for its three chain road, a 60 metre wide main street with a median and clock tower which can be viewed from the town water tower. The upgraded rowing facilities have attracted tourism, restaurants and holiday houses in Nagambie. Residential property prices moved ahead accordingly. In 2013 the Goulburn Valley Highway was diverted around Nagambie, removing the trucks and pollution from the main street, but with them the highway traffic that had sustained the town. However, tourism was given a boost later that year when a full-size bronze statue of the champion mare Black Caviar, born on a property near Nagambie in 2006, with jockey Luke Nolen dressed in Black Caviar's racing colours of salmon and black, was unveiled in its central position in front of the picturesque lake. The racehorse Black Caviar was trained by Peter Moody, winning 25 of its 25 races and claiming almost $8 million in prize money.